On 12-13 December, the ETF Youth Committee gathered in Istanbul, Turkey, to discuss the challenges facing young transport workers across Europe. As part of our Fair Transport campaign, the committee also met with a delegation of young Turkish workers. Hailing from different parts of the transport sector, 10 highly-committed young workers representing ETF-affiliated unions BTS, Liman-Is, TDS, and TÜMTIS, shared stories about their workplace experiences and the harsh realities of organising in Turkey. Turkey is a difficult country for trade unions. Workers in the country are frequently confronted with short-term and precarious contracts, the absence of proper health and safety regulations and multiple obstacles to organise. Harassment by the government and union busting by the employers severely complicate the struggle to obtain fair wages and working conditions. Turkish trade unions organise workers in many branches of transport, from the maritime and port sectors to railroads and inland transport. Especially in logistics, the mistreatment of workers has caught global attention. 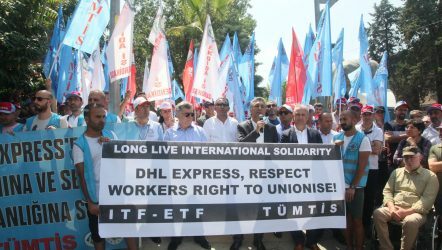 Since 2017, our affiliate TÜMTIS has been engaged in a fierce struggle with the company management at DHL Express Turkey. We had high hopes in September 2017, when DP-DHL made a global promise to recognise unions everywhere. But when TÜMTIS started organising at the company, 9 workers were wrongfully dismissed. The 9 workers thereupon started picket actions, while the union went to court to fight the company’s decision. The court gave reason to TÜMTIS, furthermore confirming the union’s right to negotiate a collective bargaining agreement (CBA). A company appeal came to nothing and in the face of strong international pressure from both the ETF and the ITF, the management refrained from further appeals. In July 2018, negotiations for a CBA finally started, but progress has been slow ever since. Currently standing in the way of an agreement is the company’s refusal to reinstate the 9 workers. As a result, TÜMTIS continues to call for international support so that it may achieve a fair deal which guarantees decent working and living conditions for its members. Despite all the challenges in their environment, Turkish transport unions are proudly operating on a self-sustaining basis. At the same time, they acknowledge that international solidarity can make a crucial difference. Turkish affiliates can count on our continued support. When you deny the rights of Turkish workers, you are messing with something global. We will not stop pushing for solutions to ensure that workers’ rights are respected in Europe and beyond.